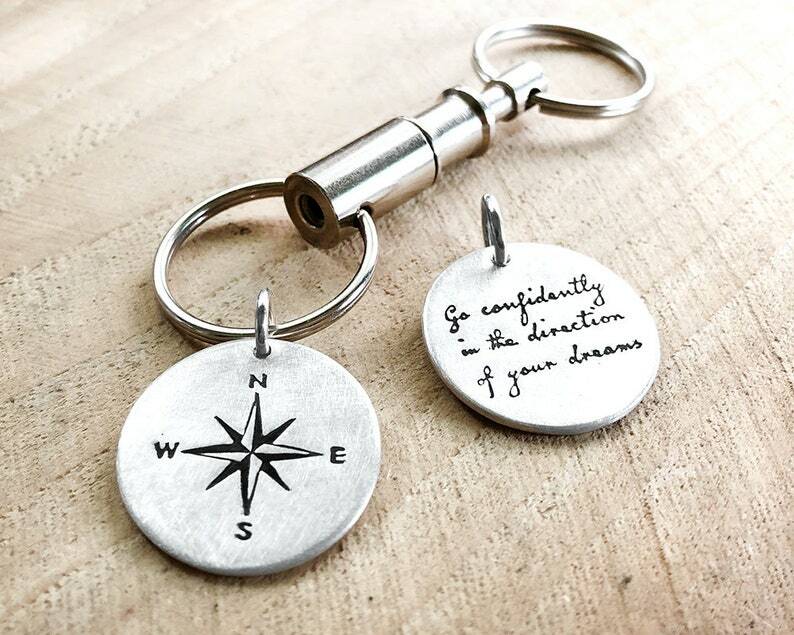 This is a two sided piece, with a compass rose on the front and a quote on the back by Henry David Thoreau: Go confidently in the direction of your dreams. You can see all of my compass designs, including more keychains, here: https://www.etsy.com/shop/lulubugjewelry?section_id=12491240 This is also available as a necklace. The pendant is a touch under 1" in diameter (24mm) and is handmade from sterling silver by me in my northern California studio. It has a matte finish and comes on your choice of a pull apart stainless steel keychain (handy when you have keys that you don't need with you all the time) or a simple stainless steel hinged ring. This comes in a recycled gift box tied with a raffia ribbon, ready for giving. Please see all photos and read the FAQs at the bottom of this listing before ordering. Very cute! Tiny as advertised! This piece is beautiful! I love that it's a piece of Fordite and the history around Fordite. I've already gotten several compliments after wearing it just once! Great experience in purchasing, it came very quickly and wrapped beautifully. Bought this key chain for my son's University graduation and he was very pleased with it.